The article discusses the use and post-production treatment of footage shot by Dutch filmmaker Louis van Gasteren in his documentary Because My Bike Stood There (1966). The images depict a young man being beaten up by the police during a clash between the forces of order and people waiting to enter a photo exhibition on, ironically, police violence that had occurred about ten days earlier in Amsterdam. 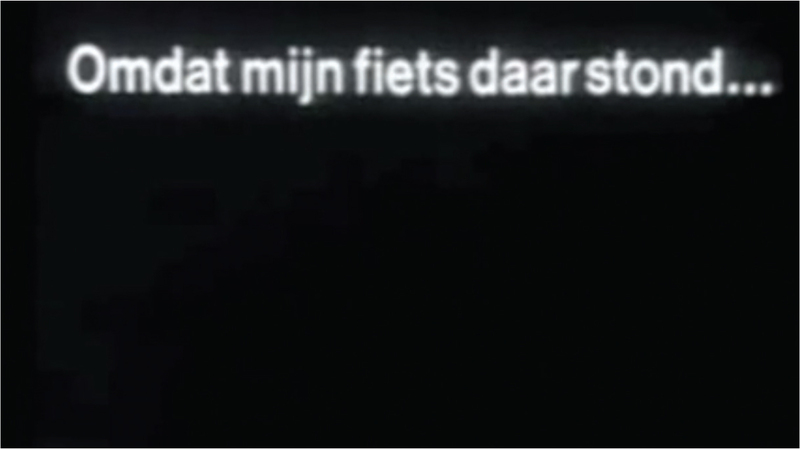 Van Gasteren combines the footage with an interview in which the victim explains that he had seen the exhibition and wanted to pass in order to walk over to his bike, when the policemen attacked him. 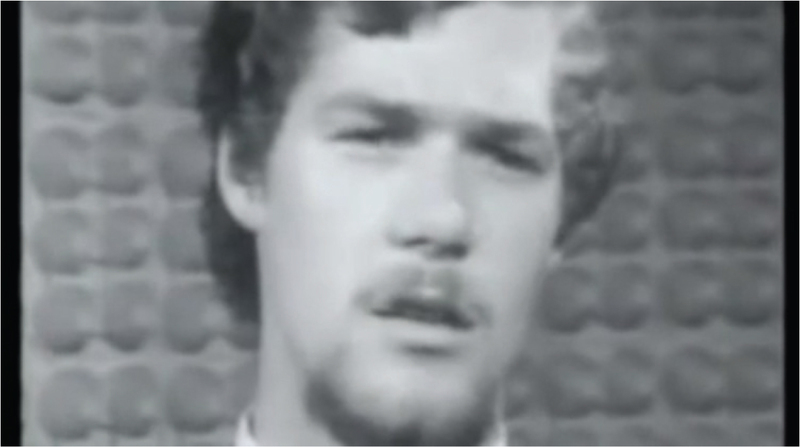 Van Gasteren used slow-motion and thus enhanced the effect of the images illustrating the young man’s narrative, a strategy used twenty-five years later by the defence lawyers during the infamous Rodney King trial. This raises the issue of how documentary footage is discursively framed to enhance its persuasive effect. Van Gasteren’s film is not only an important historical document, it also invites to reflect on the status of “visible evidence” ascribed to documentary footage. I still remember how intrigued I was in the Fall of 1988 when seeing the title of Louis van Gasteren’s Omdat mijn fiets daar stond (Because My Bike Stood There, 1966) on the list of films to be screened for the students of Film- en Opvoeringskunsten (film and performing arts) programme at Nijmegen university, where I just had started teaching. The 16mm print we showed was distributed by the Netherlands Filmmuseum and it was coupled with another Dutch film, whose title I have forgotten. Because My Bike Stood There – what kind of film might that be? It apparently featured a bicycle, one of the emblematic Dutch objects, whose ubiquitous presence in everyday life I found so impressive as a newcomer to the country: even the Dean of the faculty came to the university riding his bicycle, just as everybody else. The title made me think of some kind of an experimental film, which to some extent it turned out to be, but in a very different way than I expected (not in the least because the bicycle itself is never shown in the film). When I finally saw Because My Bike Stood There, I realised how important a historical document it was for the Netherlands. As Patricia Pisters put it, Louis van Gasteren here “captured the essence of the drastic changes in culture in the 1960s”.1 The film depicted police violence following the opening of a photo exhibition in Amsterdam on 19 March 1966, which in turn was showing pictures of the skirmishes between protesters and the forces of order during the wedding celebrations of Princess Beatrix and the German Claus von Amsberg less than two weeks earlier, on 10 March 1966. Figure 1. Title shot of a low-resolution copy, available on YouTube. The course of events is described in detail by Bert Hogenkamp in his history of Dutch documentary after the Second World War.2 The exhibition was opened by Dutch writer Jan Wolkers, addressing journalists in the offices of the publishing house Polak & Van Gennep, where the photos were on display, while a rather large crowd was standing outside. Among them was a psychology student named Bob Bermond. After Wolkers’ speech, those waiting in the street were allowed in, and Bermond stayed for about fifteen minutes. When he came out, there were still many people in front of the building. Trying to cross over to fetch his bicycle, he was hit by a policeman with a truncheon. Three other policemen joined in and the young man tried to defend and protect himself. Shortly before this incident, filmmaker Louis van Gasteren had arrived with his 35mm camera, accompanied by his cameraman Theo Hogers, whom he had accidentally met. They were too late for the opening. Noticing the commotion, they filmed the policemen battering Bermond, as well as some other violent scenes of people being hit by the police, as well as a policeman on a motorcycle driving right through the crowd. All in all, they filmed about one and a half minutes of material. Van Gasteren offered the footage to television stations, and it was actually broadcasted that very same evening in a news programme, with a comment that avoided voicing any opinion about the events. The images subsequently caused a debate about police brutality in Amsterdam. Figure 2. Bob Bermond in the first shot of Omdat Mijn Fiets Daar Stond (1966); screen shot from the copy available on YouTube. The first shot of the film shows Bermond saying exactly these words, which later are repeated several times and electronically reworked, while the title is shown: again the same words, written in white on a black background, followed by a second title with the director’s name.4 Then comes Wolkers’ speech, in which he refers to police weapons, intercut with footage of photos shown at the exhibition. Follow several shots of the crowd outside the building, and of the houses with many people looking out of their windows. Then comes the incident with Bermond being beaten by the police, a policeman on his motorcycle driving through the crowd, images of another man who is hit and kicks back at the police until they drag him away. Finally some shots of onlookers at their windows, in the street and on the other side of the canal. This seems to be all of the original footage, and it is presented without sound. Next, Bermond tells his story. He is filmed in a close shot. When he comes to the point when he left the exhibition, his narration is, as it were, illustrated by the footage we have seen just before. The moment when Bermond is hit by the policemen is repeated several times, in slow-motion and sometimes held in a freeze-frame. Even after Bermond has finished talking, this scene is shown again twice, now completely silent. The interview continues, again illustrated with the same footage in slow-motion, until Bermond starts talking about the subsequent events, after he managed to get away from the policemen. Leaning against a car he wanted to smoke a cigarette, when a policeman on a motorcycle came right at him, almost knocking him over. This is illustrated with the footage of a policeman on a motorcycle, driving through the crowd. This action, however, appears reckless rather than dangerous, while in his statement Bermond declares that a policeman was trying to run him down. So here the reading of the image is clearly influenced by what Bermond is saying. Bermond then states that he finally could walk over the bridge to get his bicycle, while the police forcefully tried to clear the crossing. Simultaneously, van Gasteren shows the footage of the passer-by being hit by a policeman apparently out of the blue, and when the man kicks at the policeman as a reaction, he is rapidly surrounded by other members of the police force and pulled away in the direction of some police cars. Interestingly, the board’s comments on Because My Bike Stood There are similar to the ones made by commentators in another case of recorded police violence, the infamous Rodney King tape, documenting the beating-up of the African American Los Angeles citizen Rodney King by four white policemen on 3 March 1991. Only the situation is reversed here: while the Dutch board banned the film because the treatment of the visual document turned the material into an even stronger denunciation of police violence, in the case of the videotape documenting the police acting brutality against Rodney King, the use of freeze-frames and slow-motion was identified as the main reason why the policemen’s lawyers succeeded in convincing the all-white jury that at least three of their clients had acted in self-defence against a potentially dangerous individual. This rather outrageously racist verdict caused protests by the Los Angeles African American community and ended in even more violence. The visual document as such, in other words, is always open to be framed in a narrative, and the defence lawyers’ strategy was to offer something like a counter narrative that used the devices of freezing certain images and slowing down the movements to make their point. This is exactly what happens in Because My Bike Stood There. Van Gasteren has Bermond’s discourse frame and orient the images. In the case of him being beaten, the correspondence between the words and the footage is visible enough (one recognises the young man in the street as being the same person as the one telling the story), but at other points, in particular with respect to the footage of the policeman on a motor cycle, it is the discourse that frames the images and makes them part of the narrative, even though it is not clear at all if the footage filmed by van Gasteren actually depict the situation Bermond refers to. Van Gasteren, it seems, understood very well that when the footage he had shot that day was broadcasted, it had not yet been used to its full effect. Having been able to identify one of the victims of police violence and asking him to tell his story, allowed him to push the effect of his footage much further. Using, in addition, techniques such as freeze-frames and slow-motion, the films rhetoric became even more compelling and turned the visual document into a documentary with a clear message. The indignation that Bermond shows about what had happened to him is all the more convincing, because the images are left to the viewers’ contemplation as freeze-frames and in slow-motion, and as it is repeated over and over again, that all of this occurred simply, because Bermond’s bike happened to be standing over there. Louis van Gastern’s film is thus not only an important historical document capturing the cultural changes of the 1960s, it also raises crucial questions that we continue to be confronted with today, maybe even more so, because the digital manipulability of images has opened up many new ways of “creative treatments of actuality”: What does a visual document say? What kind of visible evidence does it produce? What is it that I am meant to see, and is that really what there is to see? Frank Kessler is a professor of Media History at Utrecht University and currently the Director of Utrecht University’s Research Institute for Cultural Inquiry (ICON). His main research interests lie in the field of early cinema and the history of film theory. He is a co-founder and co-editor of KINtop. Jahrbuch zur Erforschung des frühen Films and the KINtop-Schriften series. From 2003 to 2007 he was the president of DOMITOR, an international association to promote research on early cinema. Together with Nanna Verhoeff he edited Networks of Entertainment. Early Film Distribution 1895–1915 (John Libbey, 2007). He also published Mise en scène (caboose 2014).